This page in the website was born of the desire of writing ideas and facts of Carussin’s day-to-day! Since May, one of the family’s pillar: Bruna’s mother, is crossing a delicate period, and the time is not the best for Bruna to write on her “diary”!!! Therefore, we wish on the other hand to involve you on the readings that are laying on desks and nightstands of our family!!! Share with all of you our readings is a certain way to keep in touch!!! It is not at all an explicit way of communicating, but for those who wish to go further on using that “energy” we all have of communicating not verbally, of reading non “between lines”, but “between titles”!!! We expect, later, an exchange of ideas, opinions, interpretations and everything that comes to your mind in front of a glass of Barbera d’Asti! “L’Invenzione della Gioia. 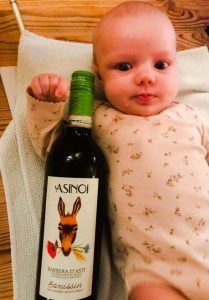 Educarsi al Vino. Sogno, Civiltà, Linguaggio.”, Sandro Sangiorgi: This book is a true treatise and the ambition of Bruna, actually, for years Bruna has a copy of this fantastic book on her nightstand, but… she can’t move on!!! She’s not giving up, even if it is too hard for her!!! “I Sapori del Vino”, Fabio Pracchia. “Il Vino Capovolto”, Jacky Rigaux and Sandro Sangiorgi. “Verde Brillante”, Stefano Mancuso and Alessandra Viola. “La Barbera è Femmina. 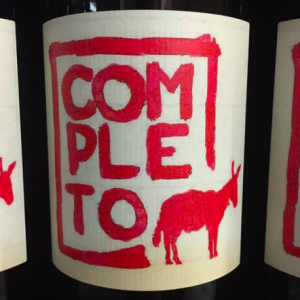 Viaggio Non Sentimentale alla Scoperta del Vino e di un’Italia che Cambia”, Marzia Pinotti. “L’Utilizzo delle Erbe Aromatiche in Agricoltura. Una Via per la Comprensione dell’Agricoltura Biodinamica”, Franz Lipert. “Tra l’Asino e il Cane: Conversazione sull’Italia che non c’è”, Francesco Pugliese and Claudio Cerasa. “Creare con il Feltro”, Henriette K. Foldenauer. “Decorazione su Tessuto”, Loris Giuriatti. “L’Intelligenza degli Animali”, Danilo Mainardi. “Scintille di Luce”, Madre Elvira. “Ho Fame: il Cibo Cosmico di Maria Montessori”, Maria Francesca Venturo. 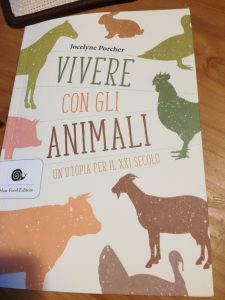 “Vivere con gli Animali, un’Utopia per il XXI Secolo”, Jocelyne Porcher.